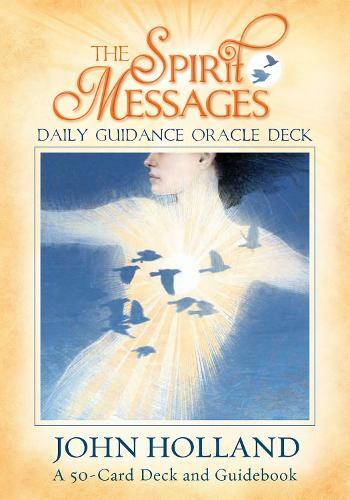 The Spirit Messages Daily Guidance Oracle Deck, with its accompanying guidebook and 50 beautifully designed cards, was created by John Holland to assist you in getting support, comfort and divine guidance from Spirit, your loved ones, family, ancestors, friends, guides and helpers in the Spirit World. These cards will also help the user to develop a higher awareness of Spirit and remind you that you are never truly alone. These extraordinary cards will bring insight and clarity around some of the major decision points in your life, or just to reaffirm that you're making the right decisions. The Spirit World communicates through these cards with guidance and direction in matters of self-love, vulnerability, relationships, trust and more. As you work with these cards, they will strengthen your natural ability of intuition and the beautiful, loving bond that you and the Spirit World share.